Henry V has died. His body is not yet cold but three provinces of France have fallen for lack of men and resources. Henry's son, nine months old Henry, is named King Henry VI of England and France. His uncle, Humphrey Duke of Gloucester, is named the King's Lord Protector. Seventeen years later, Edmund Mortimer (Michael Gambon), a Plantagenet in direct line of succession to Richard II, dies and leaves his nephew Richard as heir. The king recognizes Richard's claim and makes him Duke of York. Moreover, France is in turmoil again. Henry VI (Tom Sturridge) sends Lord Talbot Earl of Shrewsbury and his son, the Earl of Warwick, and Richard Duke of York to fight the French. William Earl of Somerset must provide them support and fails intentionally to do so, thus Lord Talbot and his son are killed at Rouen. Joan of Arc, on behalf of France's Dauphin, leads the French army at Rouen and Anjou, where she is captured and burned at the stake for treason against her sovereign. At Anjou, The Earl of Somerset claims Margaret, the Duke of Anjou's daughter, as a bride for his king, thus becoming Queen Margaret (Sophie Okonedo). Charles the Dauphin claims more French victories, and ultimately declares himself King of France. Meanwhile, Queen Margaret realizes that while the Duke of Gloucester is Lord Protector, her husband's power, and hence hers, is meaningless. Thus, a conspiracy is born to depose and kill the Duke of Gloucester, setting in motion years of civil unrest. This episode is filled with events, intrigue, and serious power struggles. If the Bard is to be believed, King Henry VI was a spineless young man, more interested in religion than in state matters. The one thing he had working for him was his honor; he had a strong moral compass, but the England of his time needed firm governance and strong leadership, and he couldn't provide it. Among the major events played out in this episode are the rise and fall of Joan of Arc, the disadvantageous marriage of King Henry VI to Margaret of Anjou, who had a stronger personality than her consort, the alliance between Richard Duke of York and the Earl of Warwick, and the fall from grace of the Duke of Gloucester, which led the Duke of York and his sons to revolt against the king. Solid performances and a lot of political maneuvers make this episode a must-see. 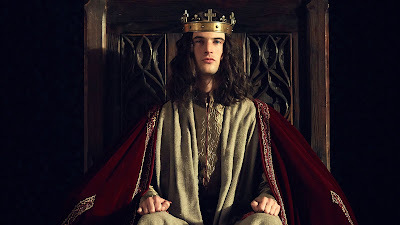 It’s been five years since Richard Plantagenet Duke of York, his four sons (Edward, George, Edmund, and Richard), and his followers have risen against King Henry VI (Tom Sturridge). Lord Suffolk and the Duke of Somerset have been killed in battle by the Yorkist men. Clifford, son of the Duke of Suffolk has vowed revenge for the death of his father, as has the Queen for the death of Somerset. King Henry VI and Queen Margaret (Sophie Okonedo) retreat to London, but the Yorkists arrive first at the Parliament-House urging Richard Plantagenet to claim the vacant throne. On agreement, the king grants right of succession to Richard Plantagenet and his sons—thus disinheriting his own son, Edward (Ned), Prince of Wales—on the condition that he is allowed to reign until the end of his life. The Duke of York vows to depose the arms, but the northern lords led by Queen Margaret, Clifford Duke of Suffolk, and the Earl of Westmorland besiege Richard Plantagenet’s castle, burn it down, and kill him and his young son Edmund. Upon the death of his father, Edward Duke of March becomes heir to the dukedom of York. Lord Warwick pledges alliance to him, as he did to Edward’s father. Deposed of his crown, Henry VI takes refuge as a vagrant in the countryside, where he is found and put in custody in the Tower. Edward Duke of York is crowned King Edward IV at Westminster. Edward creates Richard (Benedict Cumberbatch), his brother, Duke of Gloucester, George becomes Duke of Clarence, and the Earl of Warwick is given free reign. Ten Years Later…The Earl of Warwick travels to France to petition King Louis the hand of his sister, Lady Bona, in marriage for King Edward IV. King Louis grants the petition, but news arrives from England of a hasty marriage that has taken place between the king and Lady Elizabeth Grey. King Louis, feeling snubbed, grants men to former Queen Margaret, who has taken refuge with her son and her entourage at the French court, to organize an offensive against King Edward IV. The Earl of Warwick feels that his honor has been trifled with, and pledges alliance to Queen Margaret, giving Prince Ned the hand of one of his daughters in marriage to vow for his loyalty. The Lancastrians will face the Yorkist again, at the battle of Tewkesbury, with the purpose of replanting Queen Margaret and Prince Ned in the throne of England. As you can see from my summary, a lot happens in this second episode that merges part of the reigns of Henry VI and Edward IV. Henry VI once again shows that he is a man of principle but without the scheming mind needed to rule, or the militaristic prowess of his father. Queen Margaret shows more of a spine than his consort, but she also exhibits ruthlessness (as when she crowned Richard Plantagenet with a crown of thorns, stabbed him, ordered his beheading, and his head to be mounted on a spike on the city gates) and martial skills (the latter allowing her to march with her armor on into battle along with the Lancastrian faction to reclaim the English throne for her son). From the last two episodes I have formed a more sympathetic image of the Earl of Warwick than the one I had by viewing Starz’s adaptation of Philippa Gregory’s series on The War of the Roses titled The White Queen. The image created by Philippa Gregory is that he was a man of little honor and too much ambition who wanted a piece of the English throne for himself. Shakespeare’s version is more wholesome. In these two episodes the Earl of Warwick emerges as a man of integrity, conviction, and loyalty, who pledges alliance to Richard Plantagenet duly recognizing that he has a valid claim to the throne of England. His changing of sides occurred as a consequence of the ridicule that he was subjected to when Edward chose Lady Grey for his wife. Plenty of action, battles (gore included), political maneuvers, betrayals, heightened by a great script adaptation, atmospheric music, and nuanced performances make this episode a must-see in the saga. Ten years after the events detailed in Henry VI (Part II)/Edward IV, a lasting peace has ensued. 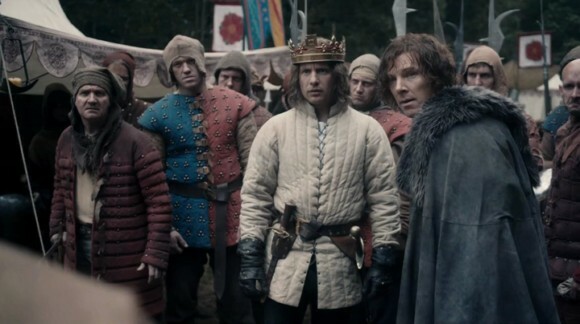 Richard (Benedict Cumberbatch), Duke of Gloucester, resents the peace and his brother, the king, for it. Someone puts twisted words in the king’s ear about a certain prophecy naming an enemy of the king whose name starts with G. The Duke of Clarence’s name starts with G…One less enemy to contend with. The relationship between Elizabeth and Richard is contentious at best. Then, the king falls ill and Queen Elizabeth and her clan are sure that Richard will be entrusted as Lord Protector until Prince Edward comes of age. Richard has other plans, and aided by Lord Cunningham, will remove friend and foe alike in his path to the throne and absolute power. 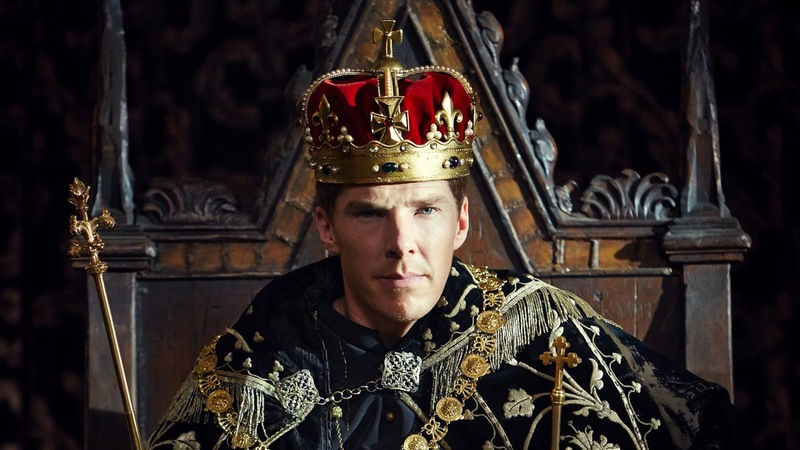 As in anything he stars in, Benedict Cumberbatch’s performance as Richard III is nothing short of brilliant. 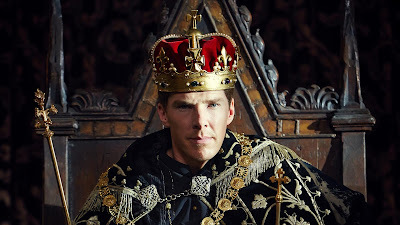 He is Macchiavelian in his methodical removal of enemies in his path to the throne, and once there, to preserve it, but I, having seen BBC’s marvelous adaptation of Philippa Gregory’s novels on The War of the Roses, The White Queen, didn’t buy Shakespeare’s utterly evil characterization of Richard III for one minute. I think the real man was more complex than that. Having read Josephine Tey’s The Daughter of Time this year, gave me a completely different perspective, a more balanced one, on the man, or at least it raised questions about the historical sources that we take for granted on the period before and after he came to power, leading up to his death in the Battle of Bosworth. My, this whole series is quite a production. When I was reviewing the retellings of Shakespeare plays in modern novels last year, I would read the play first and then the modern retelling. It was quite enjoyable. But it looks like this series, for you, is giving you more insight into those periods of British history you have read about in historical novels. I think that is pretty cool! Okay, you've convinced me. I have to watch this series! You are getting a lot out of this series! I should give it a go. Do you think I should visit the BBC's take on the Philippa Gregory novels first? Or this one first? Cheers. Glad you are becoming an expert on all these histories of Shakespeare. I know, right?! I recommend watching both, but this one definitely first, as it gives more background information before the Edward IV reign. Both series complement each other rather well. Haha - I love your choice of quote.